Frederik May 18, 2013 Comment? 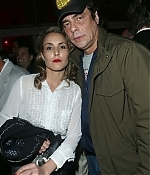 Yesterday, a blonde Noomi has been spotted at various events of the Cannes Film Festival. First, she was on hand for the press reception of her latest announced project, “Alive Alone”. She was later seen at the Worldview Entertainment Celebration and at the Finch’s Quarterly Review Filmmakers Dinner. Pictures from all appearances can be found in the gallery. Enjoy!